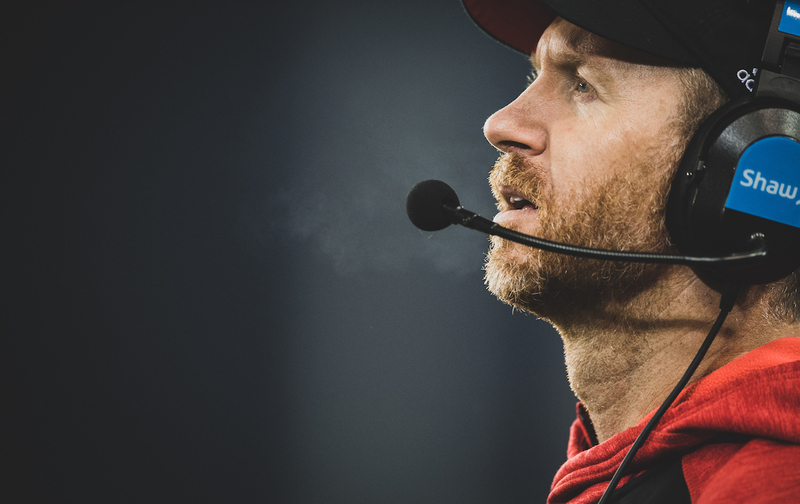 TORONTO - Calgary Stampeders rookie head coach Dave Dickenson pressed all the right buttons during his team's remarkable CFL season. He led Calgary to a CFL-best 15-2-1 mark, the 15 victories a single-season league record for a first-year head coach. He was the overwhelming choice as coach of the year in voting by the Football Reporters of Canada and his coaching peers. But with the Grey Cup on the line Sunday, Dickenson left himself wide open to be second-guessed. After trailing Ottawa 27-7 in the third quarter, Calgary had whittled the deficit to 33-30 late in regulation. And the CFL's most potent offence, anchored by league MVP Bo Levi Mitchell at quarterback and rushing leader Jerome Messam, was second-and-goal at the Redblacks' two-yard line. Dickenson decided to go with his short-yardage team, replacing Mitchell with Canadian rookie Andrew Buckley and moving the six-foot-three, 254-pound Messam - the CFL's top Canadian this season - up front to provide blocking support. The move wasn't without logic as the six-foot, 203-pound Buckley had eight rushing TDs on the year and scored on a one-yard run earlier in the game. This time, though, Abdul Kanneh tackled Buckley for a one-yard loss and Calgary had to settle for a field goal to force overtime. Game MVP Henry Burris opened the extra session with an 18-yard TD strike to Ernest Jackson before the Redblacks' defence clinched the improbable 39-33 win by forcing Calgary's offence to go three-and-out. The burning question was why, with the game on the line, didn't Dickenson call on Messam, who'd scored 11 rushing TDs during the regular season. Also, it was Messam's six-yard run that put Calgary at the Ottawa two-yard line. Dickenson's decision was similar to the one head coach Pete Carroll made in Seattle's 28-24 Super Bowl loss to New England on Feb. 1, 2015. Trailing 28-24, Seahawks quarterback Russell Wilson tried passing for the go-ahead touchdown rather than hand off to Marshawn Lynch, who had run for 102 yards in the game. The move backfired as Malcolm Butler's interception preserved New England's victory. But unlike Dickenson, Carroll didn't take the league MVP out of the game and replace him with a first-year quarterback. `"I was going to either throw the ball or work a play that we had dialed up,'' Dickenson said. "I regret that call. Calgary played most of the contest without leading receiver Marquay McDaniel, who left in the first half with a shoulder injury following a 51-yard reception. On Monday, he couldn't hide his disappointment with the final outcome. "Now I know how the Seahawks feel,'' McDaniel tweeted. Mitchell finished 28-of-41 passing for 391 yards and two TDs but also threw three interceptions after having just eight in the regular season. Still, Mitchell felt he and Messam should have been given the opportunity to deliver the victory. that is called over coaching! It was very obviously Ottawa's turn to win, they played a great game and their determination to win showed. Ernest Jackson's catch was fantastic. If you watch it again the effort he made to catch that ball said it all, he was not to be denied. just one of many great plays for them and I don't think Dickinson can take the blame for the other team having a better game. Still a great season for Calgary to remember. It was beyond enjoyable to see such an arrogant team lose in this manner. These guys have zero respect for their opponents and the CFL. As Chris Jones told Dickenson in the summer at Mosaic stadium, win with class . Dickenson blew the Grey Cup and Bo Levi said it afterward.